How do we remember who we have been, to honour the work, the moments, the learning and growing, while continuing to grow, learn, inhabit the moments, work for our present and future? As a person who appreciates the symbolic - rituals, gestures, signs and symbols - I place symbols about my person. 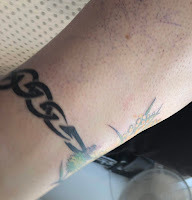 On several occasions, in quiet moments together these past two weeks, my three-year-old niece has asked, ‘Aunt Sarah, what is that on your arm? Where do your rings come from? What about your earrings?’ And I reply, what does it look like? 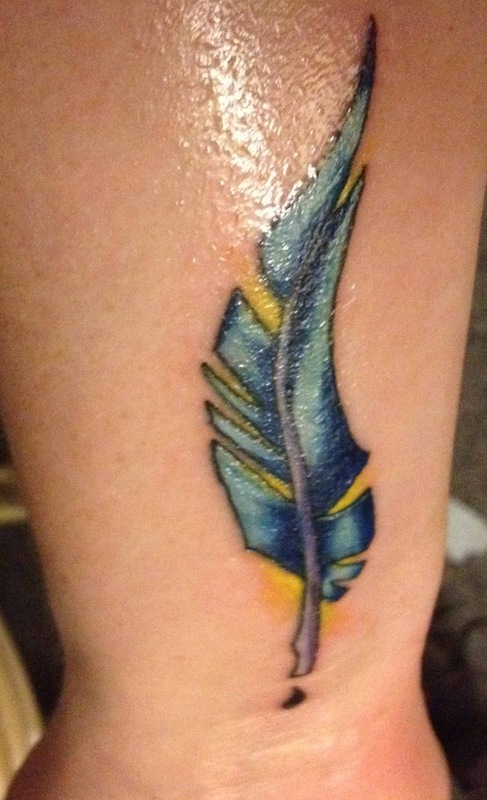 The picture on my arm looks like a feather, as does one of the rings, another is a butterfly. They come, the rings, from Santa Fe and Scotland, Adelaide, England, and Prague. I don’t tell her yet, but I am certain I will as her already sound understanding grows even more, that the feather ring and tattoo are symbols of the season in which I stood confidently, embracing my identity and role in the community as storyteller-poet-minister. The Scotland rings connect me to a land of our ancestors, a land across the seas in which I feel as much at home as I do on our big southern island continent; one is extra special for being a gift from my best friend. The ring from Adelaide has fish on it, the sign of my choice to walk the Way of Jesus I wear every day, when the cross is something I wear around my neck when I stand in the role of minister. The Prague Garnet butterfly carries in my birth stone the image of a creature that symbolises renewed and fragile life for me; Prague was another site in the season of owning my identity. The ring from England, the newest addition, is a replica of a ring worn by Jane Austen, a writer and human I admire, and is another gift, marking the moment of my graduation from my PhD. Moments, seasons, relationships, marked and carried with me on my hands, with which I write and greet and perform and preside. My ear piercings mark moments, too: the first pair my own journey through childhood, something of a rite of passage for many of us at the time. The second, from my accompanying of my best friend some years later, when she passed through that rite in her own time. The third, only one this time for me, when my youngest sister wanted someone to go first and show her it didn’t hurt (I’ve always been a good actor!). The fourth piercing, two together up the top of one ear, as I completed my studies in English literature and creative writing. The tragus (front bit of cartilage on the ear), for fun, in the same week I got the tattoo. Moments, seasons, relationships, all held dear, visible signs that are part of the me I present to the world. So, as I ask myself, how will I remember the me I was in Edinburgh, a me I liked, a me with deeper strength and resilience than ever, with gifts to offer from and on a world-respected platform; me, the scholar-storyteller, the Scottish-descended Aussie - beyond my now even stranger somewhat British sounding accent - I think about the symbols, and how will I wear them. 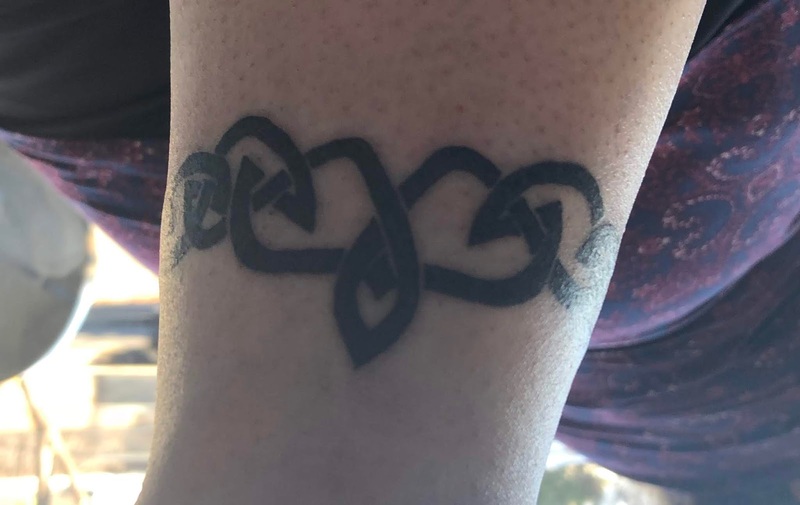 Today I will tattoo on my skin a celtic knot banded round my ankle: for the Celtic storytelling, poetic, druid/bard tradition in which I find my identity. 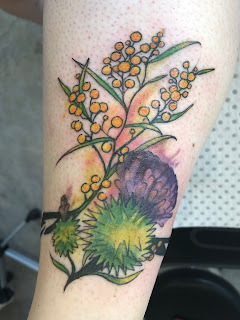 It will not close, but open at one end onto a Scottish Thistle, the symbol of my northern home, a reminder of who I became in that season and that place. 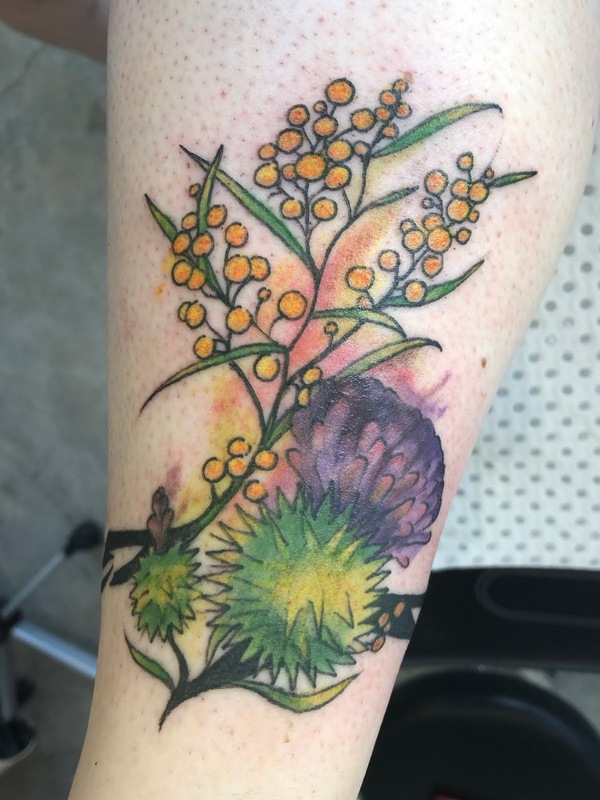 At the other end, it will open onto an Australian wattle, symbol of Home, and with that Home comes family, faith tradition and tribe, land and sea and air that have shaped my becoming and will do for most of my living. I wonder how others carry with them who they have been, in ways that honour and nurture our continual becoming? Is it the stories you tell? Is it the music you keep in your playlist, or the movies you watch again and again? Photos, mementos, magnets for the fridge ... I know someone who gets a new appliance when a new book is published. However you do it, I encourage you to remember. Not to look back so long as to forget to move forward, but to carry with you what you have learnt, to treasure the stories you have lived, so as to enrich the living of the stories unfolding right now, with wisdom and gratitude. On hearing marriage might be restricted again in our church. Midweek Musing. A musing, midweek, after news that a courageous, generous, and faithful decision on marriage might be cast aside. In July, the national council of my church, the Uniting Church in Australia, made a decision to include in our understanding of marriage that it is both between a man and a woman, and between two people regardless of gender, and to allow our members to hold either view according to their conscience (for details, see here, and here; for former President Rev Prof Andrew Dutney's reflection on this as a courageous and faithful decision, see here). This decision did not cast aside one view or another, did not declare or even imply that the old, familiar, cherished-by-many view was wrong. It did allow us to give dignity to faithful people who want to commit to lifelong partnership with the vows and covenant of marriage under law and within the church before God. Have you heard church leaders, preachers, theologians bemoan the lack of ability of congregations today to listen to a sermon? Diary of a chronically exhausted vicar. Part 1. It's Thursday. This time last week I came home for lunch after spending the morning at the church as usual, and I slept. For three hours. I had been having a great week: nice drive to Yass (an hour away) on a lovely sunny Monday; productive day Tuesday planning worship, finishing off a translation of a portion of Acts, pastoral visit and a walk to the post office in the afternoon; a long walk and a hearty breakfast with church folk Wednesday morning, lunch with more church folk, and more work on the translation in the afternoon. Thursday was an early start for the midweek prayer service, but I can usually perk up after coffee. I yawned my way through the whole morning, feeling myself skidding towards a crash. I have written of the chronic exhaustion that plagued me throughout the PhD years. Debilitating financial stress a major culprit, and for many years before those three alone. No doubt 20 years of living with depression didn't help, either.